Virus Killer is one of those fun, classic style arcade games that sticks around because it is simple, dumb, challenging fun. The idea of the game is we are looking at a Windows PC desktop with such applications as Internet Explorer, Outlook and MSN Messenger icons sitting on the desktop. In the middle of the desktop are our personal files. Little bugs crawl out of the application icons and crawl toward our files with the intention of eating the files or carrying them back to the application icons (and thereby stealing the files away to the Internet). Our job, as the player, is to manoeuvre cross-hairs over the swarms of incoming bugs and blast them with our laser. The challenge in the game lies in two parts. One, as the levels progress, there are more and more bugs in each wave, invading our computer. Second, we have a limited amount of power in our virus-zapping laser. This is one of those games where, sooner or later, there will be too many bugs coming too fast and we will lose. It’s not a matter of if, so much as win, but the fun is in seeing how long we can hold out. To help us defend our documents, there are power-ups dropped occasionally on the desktop. One type of power-up refills out energy, giving us longer lasting lasers. Another power-up causes all bugs on the screen to explode, giving us a breather. The final power-up can be collected and used whenever we want. This final power-up is perhaps the most powerful and it freezes time, giving us a short break and letting us zap bugs as they are held immobile. The game is quite simple, but its use of computer terms and its friendly comedy at the expense of older versions of Microsoft software, give this desktop arcade game a lighthearted feel. It’s also quite a bit of fun. 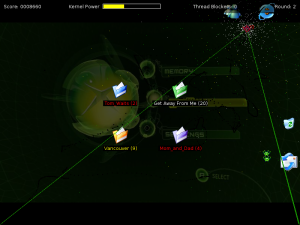 There isn’t a whole lot of strategy involved or planning, it’s just good, simple fun to blast away at the virus bugs. One nice touch the game throws in is that the folders and files that appear on our game desktop have the same names as files on our computer. Virus Killer scans our files when it starts up and adds a personal touch by having us protect our real-life files. 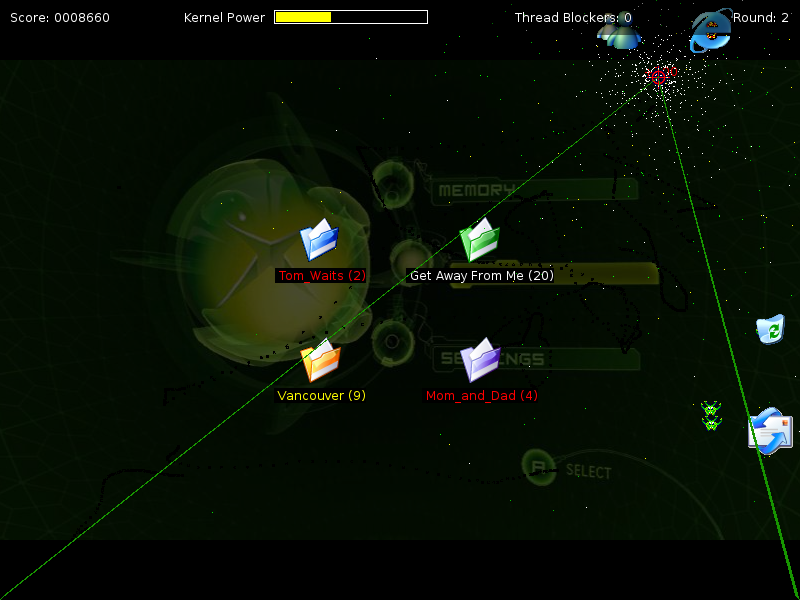 Of course the real files are not harmed, Virus Killer only uses their names to personalize the game. Virus Killer is simple, it’s fun and it’s a good way to turn the brain off for a few minutes. Any link where we can find this game? I tried http://www.parallelrealities.co.uk/ (found it on softpedia) but it doesn’t work. Anyway, I couldn’t find Virus Killer on their website but I honestly didn’t bother to look too much. The original website for Virus Killer seems to have been taken down. People running mainstream Linux distributions can find the game in their repositories. FreeBSD users can find Virtus Killer in the ports collection. If Virus Killer is not packaged for your operating system, you can probably get the source code from the Debian repositories and try building it from source.